LNB 4 Outputs- 4k Quad LNB 40mm allows four separate receivers to be connected to a single Quad LNB and allows the full range of tuning options to be used. The LNB has a built-in multi-switch which eliminates the need for an additional switching unit. Weather Resistance- The Universal Quad (4) LNB is designed to withstand harsh environmental conditions. All internal electrical components are completely sealed from moisture. In addition, the 4k Sky quad LNB has a weatherproof plastic housing to keep out the worst of the elements. LOW NOISE FIGURE: Low noise figure single satellite quad LNB allows reception of Ku band signals with the highest possible signal level and quality. Also have LNB adapter that allows you to use Universal LNBs with a 40mm Neck diameter to be hold on the latest MK4 Sky / Freesat Satellite Dish. Easy Setup- This device simple to use all you need to do is align to the satellite of your choice then add your cable, connectors and your own receiver. Sky Quad LNB also have sliding cover to protect 'F' terminals. Quad LNB 40mm with the adapter to fit Mk4 BSKYB dish. Quad LNB gives you 4 independent LNB feeds which can receive switching signals from 4 digital tuners and allows the full range of tuning options to be used. These being Horizontal, Vertical, High Band and Low Band. Quad LNBs are subjected to rigid quality control standards, ensuring you will receive the highest image and sound quality. Ideal for Multi-Room Setups and Multiple PVR Setups. 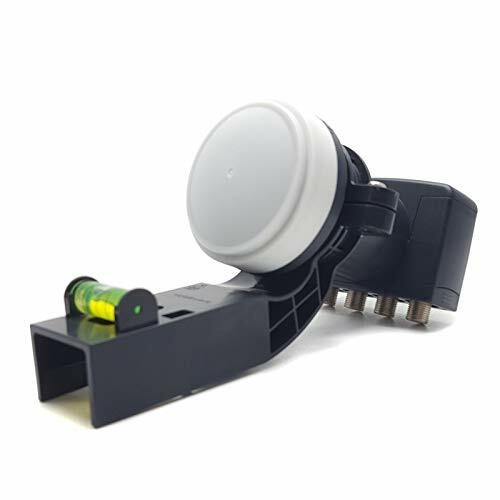 The LNB outputs are switched by the satellite receiver, with a 22Hz tone and a switching voltage which makes it like a universal LNB with four outputs. This Quad LNB can be used to replace an existing LNB that is either faulty or doesn't have enough 'F Connector' ports (for example if you wish to add another receiver box to your house). This Quad LNB will allow up to 2 satellite receivers with dual tuners (recording capability such as Sky HD) to be attached or 4 single tuner satellite receivers.